New Delhi: The retirement age of Central Government Group A officers may be raised from 60 to 62 years to help put their acumen to an extended use. Indication in this regard was given by a top official of Department of Personnel and Training (DoPT) on condition of anonymity. “The government is seriously thinking of enhancing the retirement age of the Central Group A officers to 62. The kind of acumen they achieve by the time they reach the age of 60 should be put to use for another two years. The government would seriously work on the feasibility of this proposal,” he said. He, however, clarified that the proposal to increase the retirement age will be limited to regular Group A officers. Besides Central Group A officers, it will also be implemented to All India Service officers (IAS, IPS and IFS), he added. 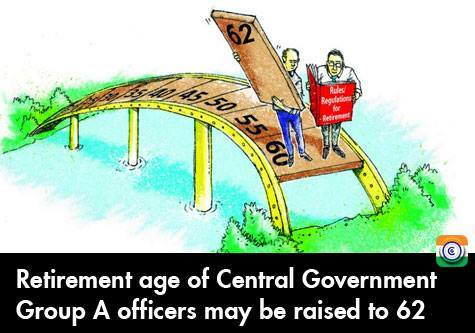 Currently, the retirement age of Central government employees including Group A officers is 60. In all, about 48.85 lakh employees are working under central government. Amongst 48.85 lakh central government employees, 85% are holding Group-C posts and 12% are holding Group-B posts whereas employees holding Group -A posts are only about 3%.